Hey there! When I started this blog, I set myself a mission to recreate as many traditional breakfasts from all around the world as possible. Many people skip the breakfast, but in my opinion, it is the most important meal of the day. Your body and brain need some fuel to start moving for God’s sake! That’s why I find it insanely interesting to discover what people eat for breakfast in different countries across the globe. Let’s go! After a couple of European breakfasts in a row (English and French) we are traveling towards Asia but not exactly to it. We are kinda stepping with one foot on Asia while another one is still in Europe. How so? Well, for this #10 installment of the “Breakfast around the world” post series we are in Turkey! A uniquely geographically located country, which is positioned at the crossroads of these two continents. Despite the fact that only about 5% of Turkey’s land is in Europe, the country’s largest city, Istanbul, is there. That’s a good thing for us, foodies, because we get to experience the unique Turkish cuisine which is a fusion of Central Asian, Middle Eastern, Mediterranean, and Balkan cuisines. 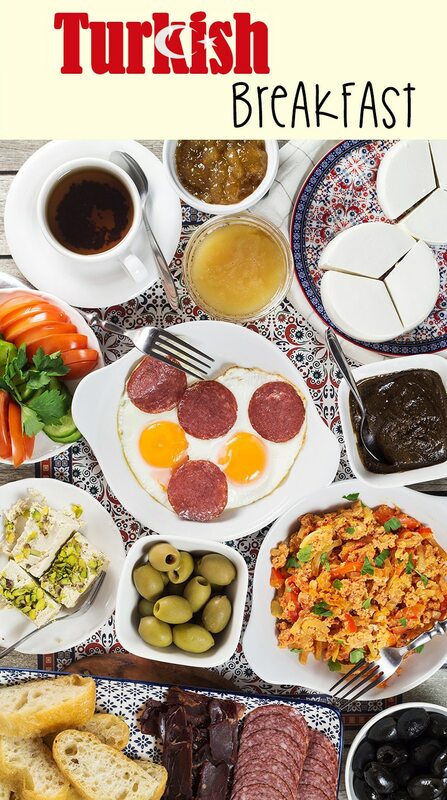 Are you excited to see what Turkish people eat first thing in the morning? I definitely am! Let’s find out! The Turkish word for breakfast is kahvalti. The literal meaning behind it is “before coffee”. That’s interesting because even despite that the Turks brought this drink to Europe and that they created a famous, confirmed by Unesco as an Intangible Cultural Heritage, method of preparing unfiltered coffee called “Turkish coffee”, tea is still a clear favorite at the breakfast table. As a big tea lover, I approve this decision and give a high five to the heroes of today’s post! Breakfast is a sacred ritual for the Turks and it by no means can be called light (like, for example, in Spain). Maybe today, with the stressful, fast-paced life, some people in Turkey lighten their breakfast up but in this post, I will talk about the traditional morning fare which is still the case in smaller towns, villages, or on weekends in bigger cities when people have more time to prepare the meal. That’s where the most interesting local foods are involved! 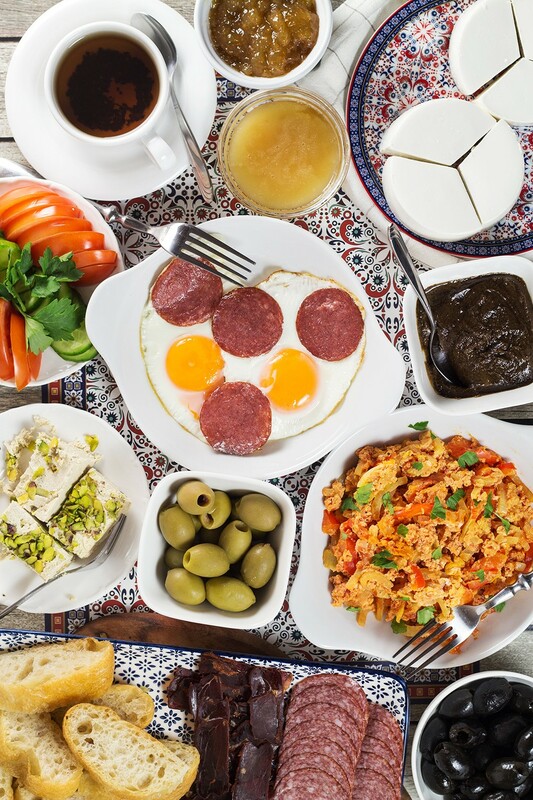 Authentic Turkish breakfast usually covers the whole table. It’s rich, hearty, and really filling. Turkey is a big country so there is no surprise that there exist some local differences in every region. 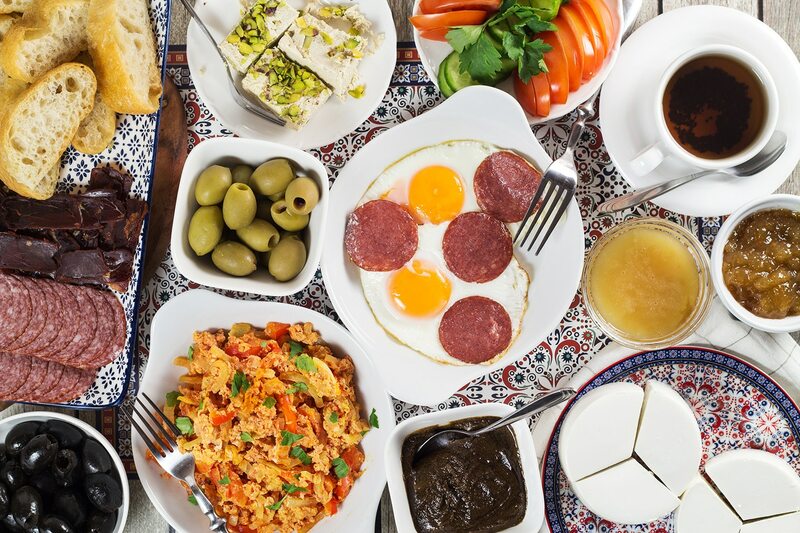 However, there are things that can be found everywhere: eggs, bread, multi-colored olives, various types of cheese, butter, veggies (tomatoes, cucumbers, bell pepper), jam, honey, kaymak ( a creamy dairy product), cold cuts, spreads, pastries, tea, and the list goes on and on. Let’s take a closer look at what I managed to get for my Turkish breakfast table! Bread is a staple in Turkey and there is no breakfast without it. There are many different types of bread available but the most common is white bread. However, grain breads become more and more popular today too. I am not sure which one of the Turkish breads I managed to get at my local supermarket and how it is called but the only information I got from its label was that it’s a “Turkish bread”. Not too specific, right? I won’t curse the shop for the lack of information, though, because it’s a miracle alone that I was able to find it in my town! I didn’t expect it all and was ready to buy a simple baguette to serve on the table but, oh boy, you can only imagine how big of a smile appeared on my face when I saw it! Talking about pastries, unfortunately, I wasn’t able to get any. But just for the information I will name the most popular ones. First one on the list is Börek – a Turkish breakfast classic. It’s made of phyllo dough with various different fillings: minced meat, cheese, potatoes, to name a few. Oh, I would love to taste it so much! Adding to my list of things to try when visiting Turkey. Other popular pastries are Simit (sesame seeded bread rings) and Gözleme (made of yufka dough and filled with vegetables, meat, or cheese). Another breakfast table staple in Turkey. Once again, there exist dozens of different types of cheese but there are a few that stand out from the crowd. One of them is beyaz peynir – white soft salty cheese similar to mild feta. That’s the one I got! I LOVE feta and I have it quite often, either in my salads or just crumbled on literally ANYTHING so I had no problem with the Turkish beyaz peynir. One of my favorite weekend breakfast dishes is fried eggs with crumbled feta cheese on top so you can say that Turkish breakfast is right up my alley. Yellow cheese such as kaşar peynir or kashkaval can be also served. Ah, I remember those times when every single morning of mine started with a sausage, prosciutto, or any other type of cured meat either served alongside fried eggs or on a piece of bread with butter. So good! However, I pulled all my strength together and changed my eating habits dropping cold cuts from the menu and adding oat porridge, cereal, and other similar healthy stuff instead. BORING. I still enjoy my favorite breakfast on weekends, though. The Turks have a few items we should talk about. First one – a dry, spicy sausage called Sucuk. It’s usually made with beef since Turkey is a Muslim country and the majority of people avoid pork. This sausage can be served simply cut into pieces to enjoy it with a piece of bread but usually, it’s fried along with eggs. That’s exactly how I prepared it. 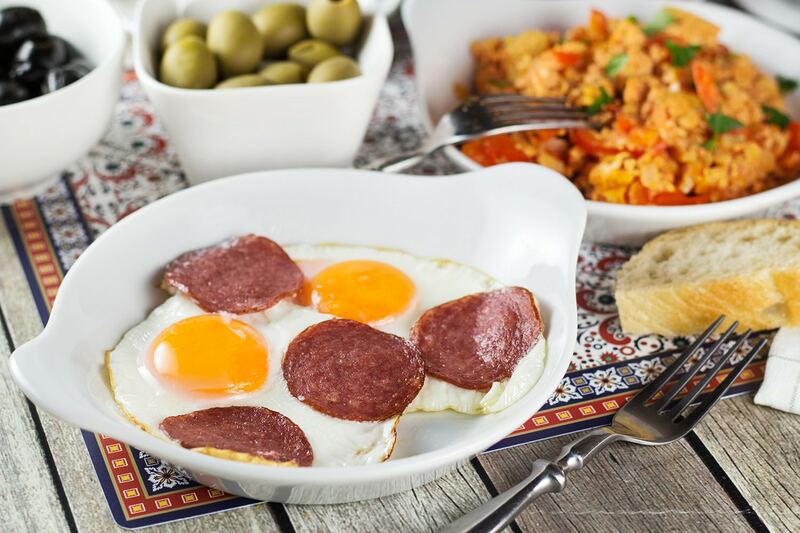 It’s funny because I have had a dish like that (fried eggs with slices of cured sausage) for years, the tradition I got from my parents, yet I couldn’t have imagined that all this time I was having Turkish food, ha! By the way, I wasn’t able to get Sucuk in my town but I don’t think it’s too much of a loss because we have a huge selection of various dry cured sausages from which I picked a spicy one. Pastirma is another favorite. A highly seasoned, air-dried cured beef. 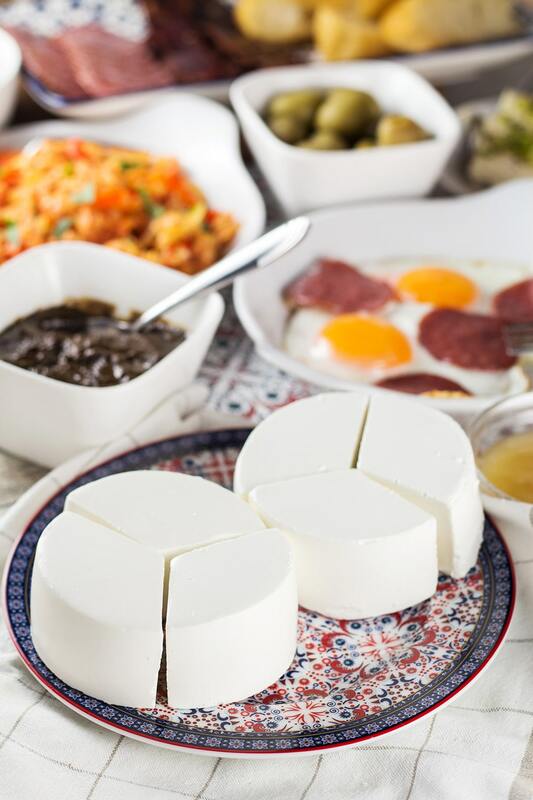 I was already familiar with it, even before starting to explore Turkish breakfast, because, having originated in Armenia, it can also be found in Russia and nearby countries (mine is not an exception). 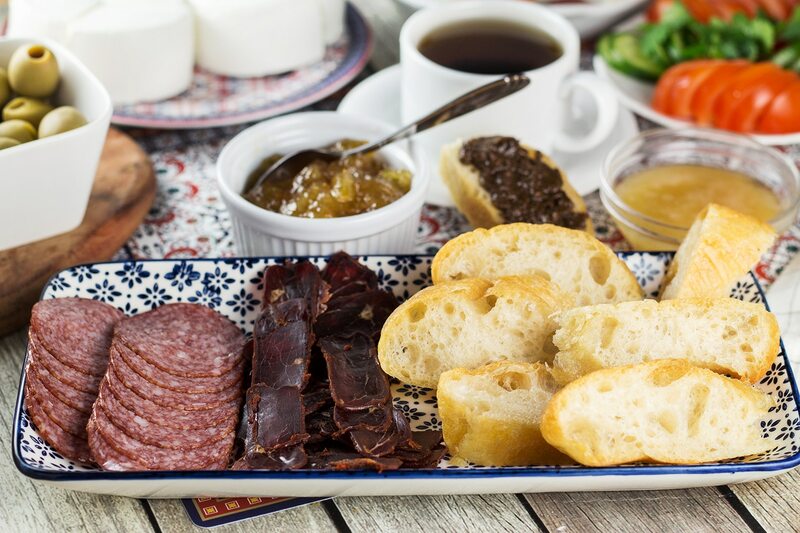 Pastirma is usually served along with eggs, just like Sucuk. If I would have to name one ingredient that can be found in almost every single breakfast all around the world, it would be, without the slightest doubt, the eggs. Turkey is not an exception. I already talked about fried eggs with Sucuk but they can also be served boiled, as an omelet, or scrambled. The latter are usually mixed with tomatoes, bell peppers, and spices to create another Turkish breakfast favorite – Menemen. It reminds me of Shakshuka, just the eggs are scrambled instead of frying them. Super delicious! Turkish people love a vast variety of condiments on their breakfast table. Let’s start with fruit jams. Rose jam, orange marmalade, fig marmalade are the popular choices. Specifically for this breakfast, I tried fig jam for the first time in my life and it’s freaking amazing. Honey is a staple too. The Turks love their honey. Especially in a combination with Kaymak – a clotted freshly-made cream. Just mix it with honey and spread generously on a freshly baked soft bread. I am one hundred percent sure that it’s heavenly but unfortunately, Kaymak is not available in my town (sad face). 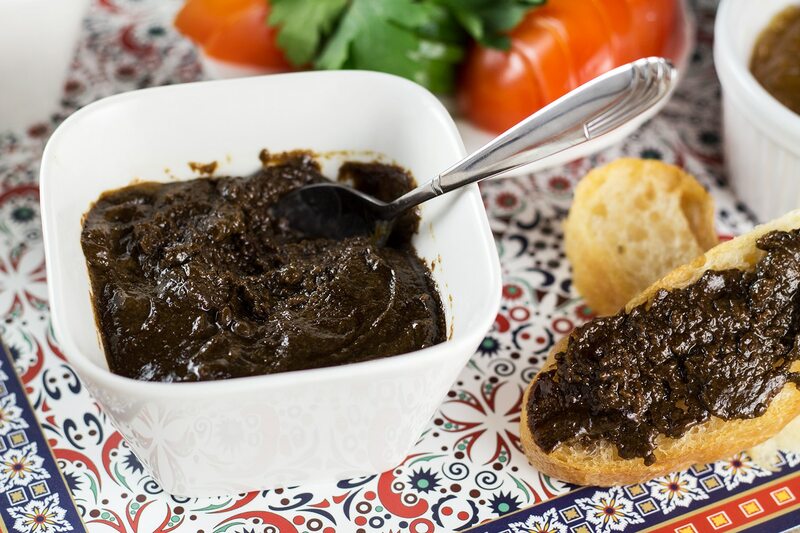 Another favorite is Tahin Pekmez – a sweet spread which is basically a combination of two things: Tahin (Tahini – sesame seed pasta) and Pekmez (grape molasses). It’s usually eaten slathered on fresh bread. I made Tahin Pekmez myself combining 2 parts Tahini and one part simple molasses (I saw some bloggers make it this way) because I couldn’t get a grape version. Well, I don’t know how the authentic spread tastes like but I loved my creation! It’s sweet and filling. I hope to try a real one someday! Like I already said in the beginning of this post, tea is a clear champion in Turkey. Black strong one is the favorite. Coffee is usually not included with breakfast and is enjoyed later in the day. Fruit juices are also popular, especially pomegranate. Stands offering a freshly squeezed pomegranate juice can be found on every corner! The last thing I want to talk about is Halva. Guys, if you don’t know what it is and have never tried it before, let me tell you this. It’s bite-your-fingers-off-good. 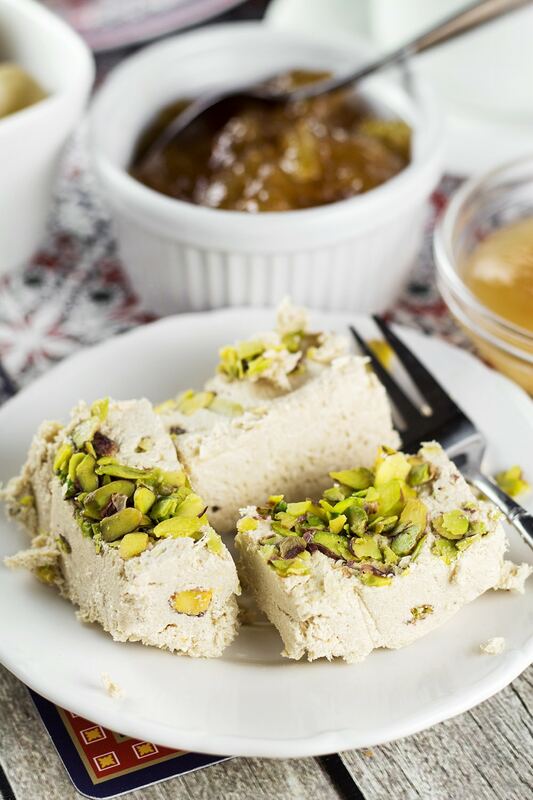 Halva is a sweet confection popular in many countries and Turkey is one of them. It can be made from nut butter such as tahini, sunflower seed butter or others. I grew up with Halva and I’m always happy to enjoy it with a big cup of tea. Tahini is not popular in my country so usually, a version with sunflower seed butter can be found in local shops. However, specifically for this Turkish breakfast post, I got the authentic sesame seed Halva. The flavor is amazing! I am not sure if the Turks enjoy Halva for breakfast but I read in some places that they do. If there are any Turkish people reading this post, please clarify this for us, thanks! The last but not the least part of the breakfast is veggies. Usually, it’s tomatoes, cucumbers, bell pepper, and multi-colored olives. That’s it, guys! I am really happy that I’ve chosen Turkish breakfast for my #10 installment of the breakfast post series because it’s so unique. So many awesome foods and everything is crazy delicious. I would love to try the authentic one and compare it to the breakfast I managed to throw together being thousands of miles away from the actual location! If I made any mistakes, feel free to tell me about it in the comments section below. I always love to hear from the locals. Thank you, Turkey, and see you, guys, in other “Breakfast Around the World” posts!